Sunlight contains two types of harmful UV rays: UVA and UVB. Both is carcinogenic and not only on sunny days, but also on cloudy days with high UV radiation. UVA rays can cause premature aging of your skin in the form of wrinkles and age spots. Even sensible sun exposure can have cosmetic consequences because the sun in any case causes premature skin aging. Sun damaged skin has lines, hangs, looks like leather, rough, dry, yellowish or stained. The effect is called “photo-aging”. We are exposed to UVA rays even inside cars and rear windows as UVA rays will not be stopped by the window glass. We cannot see UVA rays, so it is very important to ensure a sunscreen that protects well against UVA rays. 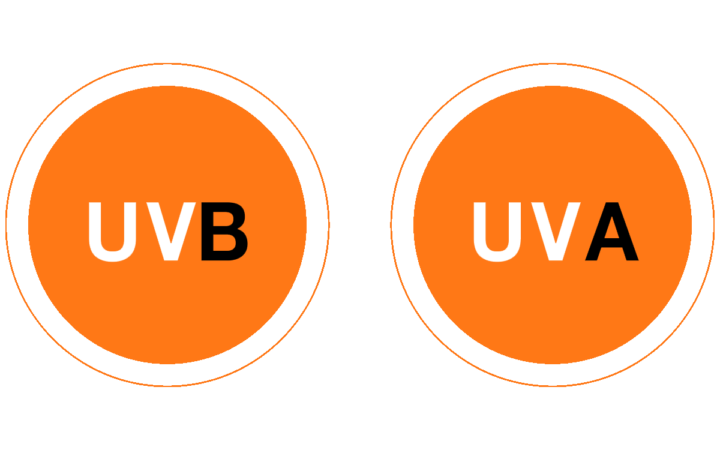 UVB rays are stronger and therefore the primary cause of sunburn and skin cancer, but are blocked by window glass. UVB rays are responsible for sunburns and play a significant role in the development of skin cancer. Prior to 2006, sunscreens primarily protected against UVB rays. It is not possible to prevent UVA and UVB rays, but in return, it is possible to reduce the effect. The difference is amazing when you compare skin that has been protected from the sun with skin which for years has been sunburned.